The stock ( capital stock) of a company or business entity is equal to the original capital paid into the business by its founders. Stock: The stock of a company represents the original capital paid into the business by its founders. It serves as a security for investors. shareholder: A shareholder legally owns at least one share of stock in a company and has rights with regards to the company because of this. Ownership of shares is documented by issuance of a stock certificate. A stock certificate is a legal document that specifies the amount of shares owned by the shareholder, It also specifies other aspects of the shares like the par value or class of the shares. Other documents will specify what rights come with ownership of certain classes of stock. 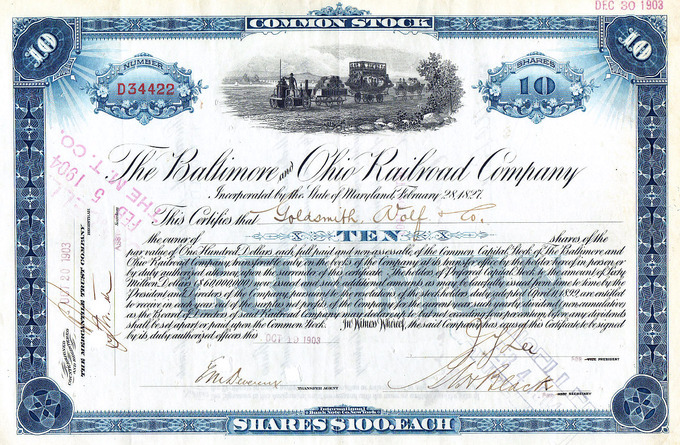 1903 stock certificate of the Baltimore and Ohio Railroad: Ownership of shares is documented by the issuance of a stock certificate and represents the shareholder’s rights with regards to the business entity.